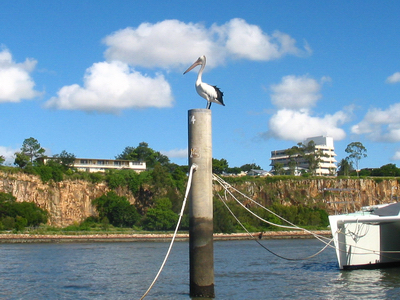 Upon leaving steamy and semi-tropical Bundaberg, we wandered in leisurely fashion down the coast and through the Great Sandy Straits to Moreton Bay into which flows - the Brisbane River. The Great Sandy Strait lies between the Queensland mainland and Fraser Island - "the world's largest sand island," as Ozzie tourist brochures repeat endlessly. There are many and varied well protected places to explore in the Great Sandy area, not least of all Frazer Island itself. Dingos are abundant on the island - a kind of Ozzie relative to feral dogs. It's suggested to keep one's distance and to NOT feed these puppies since they have really not been civilized like the dogs back home. And it's Australia, so it's always wise to keep an eye out for deadly snakes, sharks, and potentially lethal "stingers" in the water. A nice area this, with hideaways like Tin Can Town, and some potentially exciting places like the Wide Bay Bar entrance to it - a place where I heard a local production catamaran pitchpoled when trying to enter in the dark having dug both its bows into the bottom on a particularly steep wave! Here's a nice peaceful anchorage with Naga tucked away under the pines. 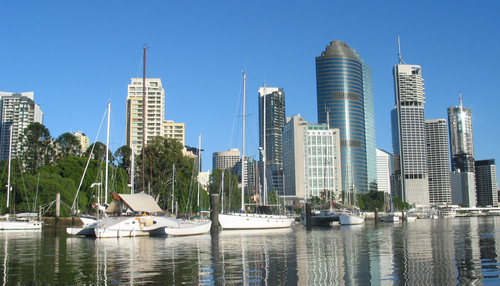 We spent a lot of months up the river in Brisbane, tied to the pile moorings just alongside the lovely Brisbane Botanic Gardens. Rent was very reasonable and we even had onboard wireless Internet access after the first couple of weeks. A pleasant walk across the gardens took us to the equally reasonably priced QUT (Queensland University of Technology) gym where we tried to keep in some kind of condition during our urban stay. We fell in love with the area's wonderful bicycle and pedestrian pathways, and also with the multitude of parks and their ubiquitous free barbeques - just push the button! Now that's a nice way to spend tax dollars! It's the first place we've ever been where the homeless could awake under a bridge in the morning and stroll over to the free "barbie" and push the button to make a cup of coffee! Not bad, Oz. On Naga we woke every day to mornings that were most often stunningly beautiful, with bird song from the adjacent Botanic Gardens and the air redolent with the garden's blooms. Many mornings we saw hot air balloons ascending taking people up for a look at the lovely city and its meandering Brisbane River. Check out the colors and the brilliant clear light in these photos - that's the super clear air of the Southern Hemisphere! What have we done to the air in the North. . . ? Chrissi bought a bicycle straightaway in Mooloolaba before we even got to Brisbane. She came paddling out to Naga with the bike somehow draped over her kayak. I was horrified at first - to have such an awkward big thing aboard our featherweight boat! But by the time we got down to Brisbane, buying my own bike was the first order of business! Of course, these were real economy expenditures, about $175 AUD total! When we left Brisbane, our bicycle adventures for 6 months had cost us, perhaps, $40 ozzie, about $30 USD. And the pleasure we had cycling around together or alone - wonderful. 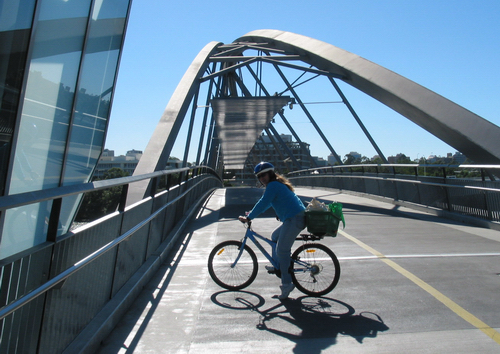 Here's Chrissi on her bike on the delightful Friendship Bridge. Looks like some good fresh vegetables there, so we were probably just returning from our regular Saturday morning shopping trip to Davis Park. 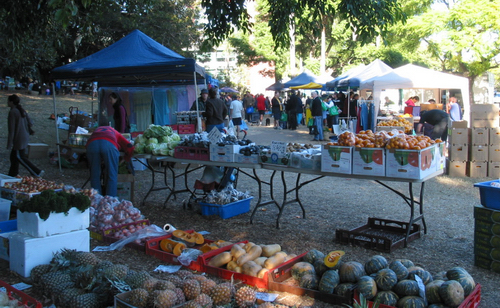 Here's just a little piece of the Saturday morning market in Davis Park. A couple of refreshing early morning kilometers along the riverside paths on our bikes, and we'd be ready for anything at the market! pelicans - among many other most amazing fauna! that nasty river water by the boats. I love my May 1st birthday - its May Day and there's always some kind of a workers' celebration on my birthday! Brisbane happened to have a terrific May Day and I found it a great way to start off my birthday. 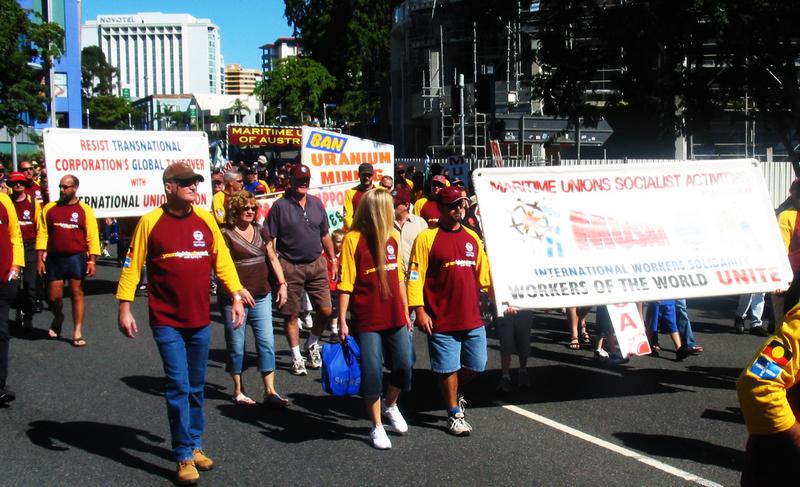 Here's the Maritime Union of Australia contingent, urging international solidarity of workers to combat the worldwide havoc caused by global corporations. Good for the Australian Maritime workers! so it was time to leave at last, rather late in colder and rougher weather. 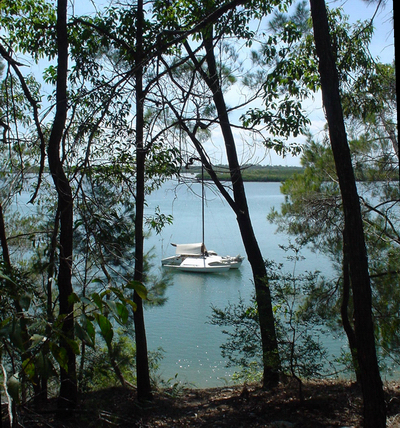 for the wilds of the Queensland coast. we had this lovely sundown with the dramatic Glass House Mountains in the background. We did a hop from Scarborough up to convenient Mooloolaba, where it rained an awful lot of cold rain. 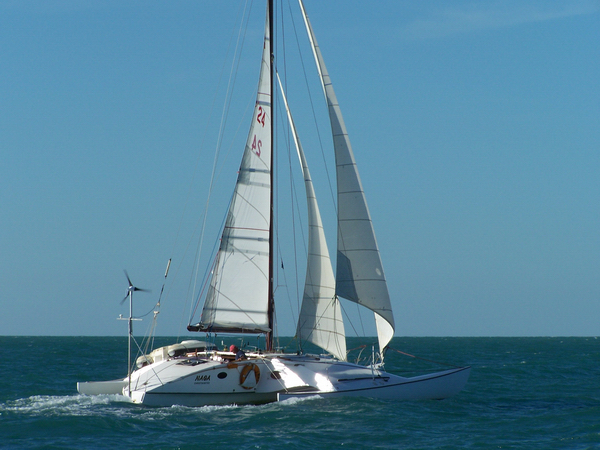 Then, when the weather had "cleared" a bit, we sailed out and zoomed past the Wide Bay Bar and the Great Sandy straight, and past Airly Beach and the Whitsunday Islands direct to Cairns. It was rough and wild and rainy and wet for most of the trip. But we were signed up for the 2006 Sail Indonesia Rally, and we needed to get to Darwin at least a week before the start of the Rally on July 22nd. One reason we were late was because of complications installing my new SUPER Autopilot - an NKE Gyropilot 2 autopilot, the same one used by most around the world racers, both monohulls and multihulls. The manual - in rather typical French fashion was awful, replete with contradictions and vagueness in the installation procedures. Even worse, the unit came through with a defective central processor which necessitated midnight calls to Newport in America and other complications - like getting the warrantee replacement item . . . in Cairns! I must say that, while the installation was a bit of a nightmare, the NKE pilot proved to be quite a fantastic improvement on the boat. This thing seems to steer very well in just about ANY conditions! After a busy week in Cairns which included, along with our usual exploring, a tricky newly installed sink drain, the super NKE autopilot - with replaced central processor! 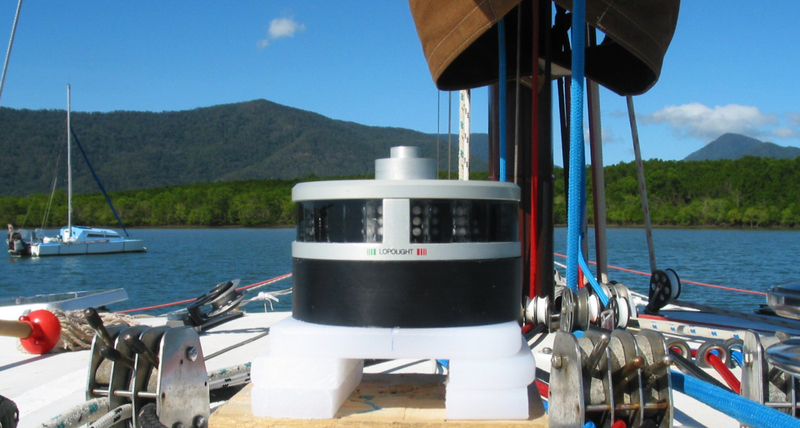 - and the new Lopolight LED masthead light, we zoomed off: up the remote and sparsely settled north Queensland coast, and on "over the top." . It was a fairly wild downwind ride for most of the Queensland coast. 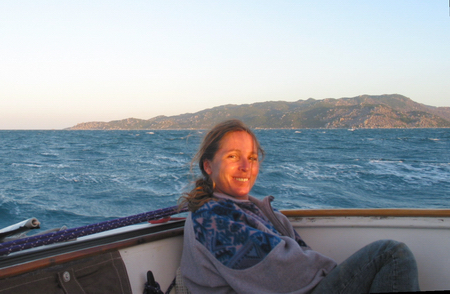 But our new NKE pilot loved the challenge of fast downwind sailing - and we did too! It was chilly at first, but a good ride - and every mile took us further north where we would find our warmer weather again, closer to the equator. With only a quick stop at Lizard Island, we shot straight "over the top" and across the Gulf of Carpentaria direct to Darwin! as we zipped past you in the approaches to Darwin! Enjoy some books about Oz!